The need for effective public transport is greater than ever in the 21st century. With countries like China and India moving towards mass-automobility, we face the prospects of an environmental and urban health disaster unless alternatives are found. It is time to move beyond the automobile age. But while public transport has worked well in the dense cores of some big cities, the problem is that most residents of developed countries now live in dispersed suburbs and smaller cities and towns. These places usually have little or no public transport, and most transport commentators have given up on the task of changing this: it all seems too hard. 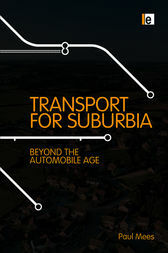 This book argues that the secret of 'European-style' public transport lies in a generalizable model of network planning that has worked in places as diverse as rural Switzerland, the Brazilian city of Curitiba and the Canadian cities of Toronto and Vancouver. It shows how this model can be adapted to suburban, exurban and even rural areas to provide a genuine alternative to the car, and outlines the governance, funding and service planning policies that underpin the success of the world's best public transport systems. Paul Mees is Senior Lecturer in transport planning at the Royal Melbourne Institute of Technology. He is the author of A Very Public Solution: Transport in the Dispersed City (Melbourne University Press, 2000).